The clan Quarrie or Macquarrie is a clan held by Skene to belong to the ancient stock of Alpine, their possessions being the small island of Ulva, and a portion of Mull. The Gaelic MS of 1450 deduces their descent from Guarie or Godfrey, called by the Highland Sennachies, Gor or Gorbred, said to have been "a brother of Fingon, ancestor of the Mackinnons, and Anrias or Andrew, ancestor of the Macgregors". This is the belief of Mr Skene, who adds, "The history of the Macquarries resembles that of the Mackinnons in many respects; like them they had migrated far from the head-quarters of their race, they became dependent on the Lords of the Isles, and followed them as if they had become a branch of the clan". Mr Smibert, however, thinks this origin highly improbable, and is inclined to believe that they constituted one branch of the Celto-Irish immigrants. "Their mere name", he says, "connects them strongly with Ireland - the tribe of the Macquarries, Macquires, Macquires (for the names are the same), being very numerous at this day in that island, and having indeed been so at all times". We do not think he makes out a very strong case in behalf of this origin. According to a history of the family, by one of its members, in 1249 Cormac Mohr, then "chief of Ulva's Isle", joined Alexander II, with his followers and three galleys of sixteen oars each, in his expedition against the westerm islands, and after that monarch's death in the Island of Kerrera, was attacked by Haco of Norway, defeated and slain. His two sons, Allan and Gregor, were compelled to take refuge in Ireland, where the latter, surnamed Garbh or the rough, is said to have founded the powerful tribe of the MacGuires, the chief of which at one time possessed the title of Lord Inniskillen. Allan returned to Scotland, and his descendant, Hector Macquarrie of Ulva, chief in the time of Robert the Bruce, fought with his clan at Bannockburn. The first chief of whom there is any notice in the public records was John Macquarrie of Ulva, who died in 1473. His son, Dunslaff, was chief when the last Lord of the Isles was forfeited twenty years afterwards. After that event, the Macquarries, like the other vassal tribes of the Macdonalds, became independent. In was, however, they followed the banner of their neighbour, Maclean of Dowart. With the latter, Dunslaff supported the claims of Donald Dubh to the Lordship of the Isles, in the beginning of the sixteenth century, and in 1504, "Macgorry of Ullowaa" was summoned, with some other chiefs, before the Estates of the kingdom, to answer for his share in Donald Dubh's rebellion. His son, John Macquarrie of Ilva, was one of the thirteen chiefs who were denounced the same year for carrying on a traitorous correspondence with the king of England, with the view of transferring their allegiance to him. Allan Macquarrie of Ulva was slain, with most of his followers, at the battle of Inverkeithing against the English parliamentary troops, 20th July 1651, when the Scots army was defeated, and a free passage opened to Cromwell to the whole north of Scotland. He steers his way for Scotland's shore". The thought of his mother brough him back once more to the island of Mull, and one morning he anchored his galleys in from of the house of Torloisk. His mother had been long dead, but his stepfather hastened to the shore, and welcomed him with apparent kindness. The crafty old man had a feud with Macquarrie of Ulva, and thought this a favourable opportunity to execute his vengeance on that chief. With this object he suggested to Allan that it was time he should settle on land, and said that he could easily get possession of the island of Ulva, by only putting to death the laird, who was old and useless. Allan agreed to the proposal, and, setting sail next morning, appeared before Macquarrie's house. The chief of Ulva was greatly alarmed when he saw the pirate galleys, but he resolved to receive their commander hospitably, in the hope that good treatment would induce him to go away, without plundering his house or doing him any injury. He caused a splendid feast to be prepared, and welcomed Allan to Ulva with every appearance of sincerity. After feasting together the whole day, in the evening the pirate-chief, when about to retire to his ships, thanked the chief for his entertainment, remarking, at the same time, that is had cost him dear. "How so?" said Macquarrie, "when I bestowed this entertainment upon you in free good will". "It is true", said Allan, who, notwithstanding his being a pirate, seems to have been of a frank and generous disposition, "but it has disarranged all my plans, and quite altered the purpose for which I came hither, which was to put you to death, seize your castle and lands, and settle myself here in your stead". Macquarrie replied that he was sure such a suggestion was not his own, but must have originated with his stepfather, old Torloisk, who was his personal enemy. He then reminded him that he had made an indifferent husband to his mother, and was a cruel stepfather to himself, adding, "Consider this matter better, Allan, and you will see that the estate and harbour of Torloisk lie as converniently for you as those of Ulva, and if you must make a settlement by force, it is much better you should do so at the expense of the old churl, who never showed you kindness, than of a friend like me who always loved and honoured you". Allan-a-Sop, rememebering his scorched fingers, straightaway sailed back to Rorloisk, and meeting his stepfather, who came eagerly expecting to hear of Macquarrie's death, thus accosted him: "You hoary old villan, you instigated me to murder a better man than yourself. Have you forgotten how you scorched my fingers twenty years ago with a burning cake? The day has come when that breakfast must be paid for". So saying, with one stroke of his battle-axe he cut down his stepfather, took possession of his castle and property, and established there that branch of the clan Maclean afterwards represented by Mr Clephane Maclean. Hector, brother of Allan Macquarrie of Ulva, and second son of Donald the twelfth chief of the Macquarries, by his wife, a daughter of Lauchlan oig Maclean, founder of the Macleans of Torloisk, obtained from his father the lands of Ormaig in Ulva, and was the first of the Macquarries of Ormaig. This family frequently intermarried with the Macleans, both of Lochbuy and Dowart. Lauchlan, Donald's third son, was ancestor of the Macquarries of Laggan, and John, the fourth son, of those of Ballighartan. Lauchlan Macquarrie of Ulva, the sixteenth chief in regular succession, was compelled to dispose in regular succession, was compelled to dispose of his lands for behoof or his creditors, and in 1778, at the age of 63, he entered the army. He served in the American war, and died in 1818, at the age of 103, without male issue. He was the last chief of the Macquarries, and was the proprietor of Ulva when Dr Samuel Johnson and Mr Boswell visited that island in 1773. A large portion of the ancient patrimonial property was repurchased by General Macquarrie, long governor of New South Wales, and from whom Macquarie county, Macquarrie river, and Port Macquarrie in that colony, Macquarrie's harbour, and Macquarrie's island in the South Pacific, derive their name. He was the eldest cadet of his family, and was twice married, first, to Miss Baillie of Jerviswood, and secondly, to a daughter of Sir John Campbell of Airds, by whom he had an only son, Lauchlan, who died without issue. SLOGAN: An t-Arm breac dearg. PIBROCH: An t-Arm breac dearg. To row us o�er the ferry." This dark and stormy water? " And this Lord UIlin�s daughter." Thomas Campbell got the inspiration for the poem when resident as a tutor near Crinan on the west coast of Knapdale, where every day before his eyes raged the stormy waters of the Sound of Jura, and he could almost hear the roar of the famous whirlpool of Corrievreckan. Whether he had in his mind any actual tradition of these legend-haunted shores is not known, but, so far as the present writer is aware, there is no incident to correspond with the poem in the actual history of the MacQuaries, who were " Chiefs of Ulva�s Isle." The island of Ulva itself, with its wonderful columnar terraces, lies on the west coast of Mull, in the great bay which has for its inner continuation the beautiful Loch na Real, immortalised as Lochgyle in Campbell�s poem. From time immemorial this island was the home of the MacQuarie chiefs. Like the MacGregors of the central Highlands, whose exploits and sufferings are so much better known, those chiefs could make the proud boast, "Is Rioghal mo dhream," "my race is royal," for both traced their descent from Gregor, son of Alpin, king of Scots, who was beheaded by the Picts, in sight of his own army, on Dundee Law in the year 837. The second son of Gregor was named Cor or Gor-bred, Latinised as Godfredus or Godfrey, and transmitted by the Culdee chroniclers as MacGotherie, MacGofra, and MacGorrie. The proper Gaelic spelling is said to be MacGuarai, and from this are derived the common modern forms of MacQuarie in Scotland and MacGuaran or MacGuire in Ireland. In the chapel of St. Oran on lona is still to be seen the effigy of one of the ancient MacQuarie chiefs. It is of unknown date, but is executed in superior style, and the mere fact of its existence among the tombs of kings and chiefs in that most sacred shrine declares that at one period the MacQuaries were among the notables of first importance in the Western Isles. The great man of the race in early times appears to have been Cormac Mor, who was Chief in the reign of Alexander II. When that king was making his great endeavour, in the middle of the thirteenth century, to overthrow the Norwegian power in the Western Highlands and Isles, he was joined by Cormac with a force of three birlinns or galleys of sixteen oars each. This loyalty to the Scottish king brought disaster upon the MacQuarie chief. On Alexander�s death at Dalrigh in the island of Kerrera in 1249, his great expedition to "plant his standard on the walls of Thurso " was abandoned, and those among the islesmen who had taken his side were left to the vengeance of their neighbours who supported Norway. MacQuarie was attacked, defeated, and slain, and his island domain subjected to all the horrors of western savagery of that time. From the general slaughter and ruin the chief�s two sons, Alan and Gregor, found refuge in Ireland. The latter settled in that country, and the name of his descendants there is said alternatively to be derived from the personal characteristic from which he was surnamed, of "garbh," or the rough. This Irish branch afterwards, under the Earls of Enniskillin, became exceedingly powerful in the sister isle. Meantime in Scotland itself the tables had been turned by the defeat of the Norwegian King Hakon at the battle of Largs in 1263, and the MacQuarie chief was enabled to come to his own again. In the wars of Bruce for the independence of Scotland, Eachuin, or Hector, who was chief at that time, consistently with the tradition of his family, took the patriotic side, and led his clan at the battle of Bannockburn. The same thing cannot be said, however, of the later chiefs of the sixteenth century. Another Eachuin, who was chief in the days of James IV., was among the turbulent islesmen whom that king was forced to take strong measures to bring to obedience, and made more than one personal expedition to the Hebrides to subdue. The judicial records of 1504 contain repeated summonses to "MacCorry of Ullowaa" to appear before Parliament to answer a charge of rebellion. MacQuarry, in his distant island fastness, laughed at these summonses, and no serious effort to arrest him seems ever to have been made by Government. In 1517, four years after the battle of Flodden and the death of James, when the country was occupied by the bickerings of the Douglases and other families who sought power by obtaining possession of the person of the Queen-Mother and the boy-king James V., Lachlan MacLean of Duart took occasion to secure a remission for his misdeeds, and at the same time stipulated for a similar favour to the Chief of Ulva�s Isle." This chief married a daughter of MacNiel of Tainish, and the bride�s dowry, which remains on record, reflects a curious light on the tastes and social circumstances of the time. It consisted of a piebald horse, with two men and two women. The latter appear to have kept somewhat to themselves amid their new surroundings on Ulva, and their descendants were long recognised there as a separate race. In 1545, during the childhood of Queen Mary, when Henry VIII. was making a strong effort to harass and overthrow the Scottish Government, Donald MacQuarie, son of the last-named Chief, was one of thirteen heads of clans denounced for entering into traitorous correspondence with the English king. Henry�s schemes, however, came to nothing, and in the disturbed state of Scotland at that time nothing appears to have been done to punish the island chief. It was probably during that troubled century that the incident occurred which is still commemorated in the name of a wild headland on the south coast of Mull. One of the Maclaine chiefs of Lochbuie, the tradition runs, had seized a certain Gorry or MacGorrie, and inflicted upon him an unusually severe punishment by flogging. When the punishment was over, and MacGorrie was restored to liberty, he took a fearful vengeance. Seizing Lochbuie�s infant son and heir he rushed to the top of the precipice, where he threatened to throw the child over unless Lochbuie consented to undergo the same chastisement as he had suffered. In the midst of all his clansmen the agonised parent was forced to bare his back and submit to the torture, his exulting enemy, when the blows slackened, constantly shouting out "More! More! " When at last Maclaine sank fainting under the stripes, and MacGorry�s vengeance seemed complete, he turned, and, the boy in his arms, with a yell leapt over the precipice to destruction. From this incident the headland is still known as Gorrie�s Leap. To the same period belongs the story of the famous pirate of the Island seas, Alan a Sop. Alan was the natural son of Maclean of Duart by a beautiful girl of his clan. She afterwards married Maclean of Torloisk on the western coast of Mull. Torloisk treated his stepson badly, and on one occasion thrust into his hands a burning cake which his mother was baking for him, so that he fled from the house. Years afterwards, having become the chief of a pirate flotilla, and hearing his mother was dead, he returned to avenge himself on his cruel stepfather. The crafty Torloisk, however, received him well, and, gaining his goodwill, suggested that he should attack and slay Macquarie of Ulva, and seize that island. By this means he hoped to get rid of Macquarie, against whom he had a grudge. 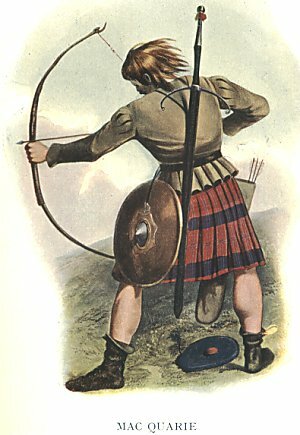 The Chief of Ulva, however, also received Alan hospitably, and when the latter, on leaving, said the hospitality had cost him dear, and confessed what his errand had been, Macquarie turned the tables on his enemy, Torloisk, by reminding Alan of the incident of the burning cake, and suggesting this as a proper object of vengeance. Thereupon the pirate returned to Mull, brained Torloisk with a battle-axe as he came down the beach to hear of Macquarie�s death, and took possession of his estate. In the seventeenth century Donald�s son, Alan, took part on the side of Charles II. in the attempt of that young monarch to recover for himself his father�s throne in Scotland. After the defeat of the Covenanting army by Cromwell at Dunbar, Charles had been crowned by Argyll at Scone, and assuming personal command of the Scottish army, had held Cromwell at bay before Stirling for a month. The Protector then tried the plan of turning the Scottish flank by sending a force under Colonel Overton into Fife. To defeat this attempt Charles sent forward a contingent under two officers, Holborn and Brown, and a battle took place on the north shore of the Forth at Inverkeitbing. In that encounter Holborn showed himself a knave and perhaps a traitor, and though Brown fought bravely, he was defeated and his force was cut to pieces. Among those who fell was Alan MacQuarie, with most of his followers from far-off Ulva. From that time the fortunes of the MacQuarie Chiefs seem to have taken a downward turn. The last of the line to inherit Ulva was Lachlan, the sixteenth chief. In 1778, finding his financial embarrassments overpowering, he sold his estates to pay his debts, and though sixty-three years of age, entered the army. He died in 1818 at the great age of 103. The greatest of the race, however, was still to play his part in history. Major-General Lachlan MacQuarie was either the eldest son or the nearest cadet of the sixteenth Chief. Entering the army in 1777 he saw active service in India as the sieges of Cannanore and Seringapatam, and from 1809 till 1821 was Governor of New South Wales. There he became famous by encouraging exploration, by ameliorating the condition of the convicts, by the erection of public buildings and works, and by laying out the town of Sydney. In his honour the rivers Lachlan and Macquarie received their names, as well as an island south of Tasmania discovered in 1811. His policy regarding the convicts, however, was severely criticised in the House of Commons, and he was recalled in 1821. Then he bought back Ulva, and when he died in London in 1824 his body was carried north and buried with his ancestors. He married, first, Miss Baillie of Jerviswood, and secondly, a daughter of John Campbell of Airds, and he was succeeded by Lachlan, his son by the latter. Lachlan, however, died without issue, and the estate of Ulva passed to another name. Septs of Clan MacQuarie: MacCorrie, MacGauran, MacGorrie, MacGuire, Macquaire, Macquhirr, Macquire, MacWhirr, Wharrie. The name Macquarrie derives from the Gaelic personal name, Guaire, meaning "noble" or "proud". According to tradition, Guaire was the brother of Finagon from whom the Mackinnon chiefs descend. This small clan possessed the little island of Ulva lying opposite the west coast of Mull, a small portion of Mull itself and Staffa, famous for "Fingal's Cave", but despite their size they were an ancient clan recorded as members on the councils of the Lord of Isles. It is said that a forme r chief of the clan, Cormac Mor supported King Alexander II in his campaign in Argyll in 1249 and that Hector Macquarrie of Ulva fought with Robert the Bruce at Bannockburn. However the first authentic recording of a a Macquarrie of Ulva is in 1463, witnessing a charter of the Lord of the Isles. In 1609 the Macquarrie chief was one of the Highland chiefs kidnapped by James VI and compelled to sign the Statutes of Iona. After the forfeiture of the Lordship of the Isles the Macquarries followed the Macle ans of Duart, who then dominated Mull. Due to this alliance the Macquarries suffered severly at Inverkeithing in 1651 when their chief, Allan and many of their clansmen died alongside the Macleans fighting for Charles II. Lachlan Macquarrie of Ulva the 16th and last chief, who entertained Dr. Johnson and Boswell in 1773 was forced to sell his lands in 1778. He died in Mull in 1818 at the age of 103, leaving the chiefship dormant. The most famous member of the clan was Lachlan Macquarrie cousin to the la st chief who became Governor of New South Wales after Captain Bligh was dismissed. Under his guidance the colony prospered and the foundations of Sydney were begun.